I have become super obsessed with making raw, vegan chocolate! My second and third round of chocolate i did not add any extra superfoods. They were simply made with coconut butter, coconut oil, cacao, coconut sugar, and maple syrup (follow the quantities from the previous post). For the second round, I made cashew butter sticks and plain chocolate sticks. 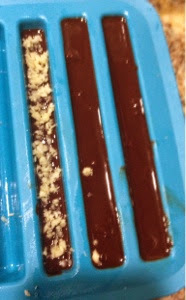 For the third round, I made crushed raw almond chocolate sticks, fig and chocolate sticks, and salted chocolate sticks as well as plain chocolate sticks (for those who don't like fancy flavors). Since i had left over cashew butter, i decided to make cashew butter sticks. I put the first layer of chocolate- filling about half of the mold- then i rolled the cashew butter into the shape of sticks and layered them on top of the chocolate. When a line of cashew butter had been made, I filled the rest of the mold with chocolate. Refrigerate until hard. 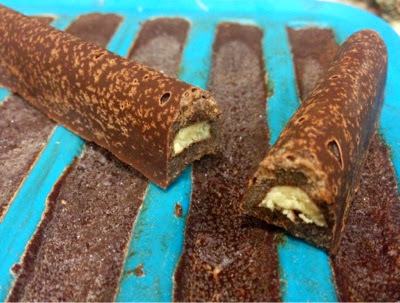 I also made plain chocolate sticks which my sister really loved. The maca and goji in the other batches was a little off putting to people who are not used to the taste of either superfood so these plain ones were a big hit. The third round of chocolates I wanted to mix things up a bit. We had some figs at home (so happy we did since i have been craving them for days!) so i wanted to try fig and chocolate. 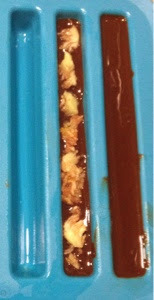 I put the bottom layer of chocolate then added a line of figs followed by the top layer of chocolate. 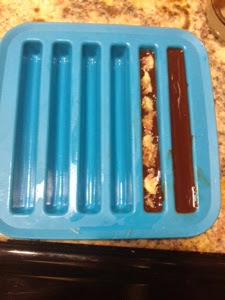 The crushed almond sticks were fairly simple as well- I had a jar of almonds soaking in the fridge so i grabbed a few, took off the skin (so easy after they have been soaking you just squeeze the almond and it pops out of the skin), blended them and sprinkled them on the first layer of chocolate. Lastly, i covered them with another layer of chocolate. The salted chocolate was done in the same way as the others: ground up pink salt, sprinkled it on top of the first layer then added the second layer of chocolate. when these were finished, i put them in the fridge to solidify.